Why wear your fitness tracker on your wrist when you could wear it on your skin? According to a recent study published in Science Advances, a team of researchers have created an ultra flexible, organic photonic skin that doubles as an electronic display. The researchers created “three-color, highly efficient polymer light-emitting diodes (PLEDs) and organic photodetectors (OPDs)” to create multiple electronic functionalities, such as displaying images on the surface of human skin. These transparent displays are thinner than the epidermal layer of human skin. Not only that, but the device can also measure blood’s oxygen concentration, as well as other health data that can be directly visualized on the body. This super-thin electronic skin addresses many of the issues created by prior attempts to create flexible electronic films — this device’s special protective coating keeps out oxygen and water vapor, so it can keep a light working for several days. The study is part of an ongoing effort to create e-skin for mainstream consumption. The benefits of this technology are tremendous: sure, it would revolutionize the way we consume and display information related to fitness and health. But it could also change the way we interact with technology — why use a smartwatch when you can just get all your notifications through a tattoo-like display on your forearm? While this type of cyborg technology is still a far-off goal, this team of researchers is taking an awesome step toward making flexible electronics a more feasible reality. 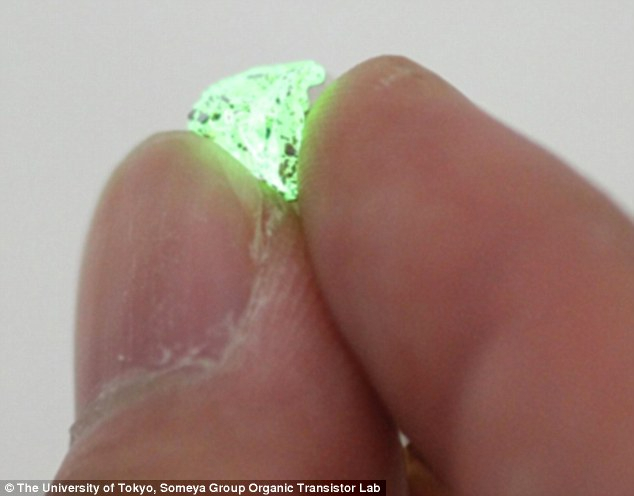 Scientists recently created a super-thin electronic skin that lights up like pixels on a screen.